September | 2014 | Welcome to the RW Carbon Blog! I ordered a carbon fiber roof spoiler, trunk spoiler, and mirror covers from them about a month(ish) ago. I was promptly emailed asking if it was ok if the order took longer to get to me because it was out of stock and had to be manufactured. This was totally ok since it was very prompt and very straightforward. Maybe a week or so later, all my products shipped. When they arrived, they were wrapped in bubble wrap and foam and were completely undamaged. All pieces fit very snug, and have almost an OEM fit to them. The carbon weave looks fantastic. They are very prompt and very polite and easy to work with. I am definitely going to be using them in the future! Is Carbon Fiber the Future for Automobile Construction? Many answers are pointing to yes. As we search for new ways to make our cars more and more efficient we find ourselves looking for the next best material. Throughout the years we have gone from steel, to aluminum chassis and even uni-body construction. So what’s next in line to replace these and take the automotive world into an entirely new dimension of efficient diving? With gas prices rising, automobile manufacturers are forced to change their habits of larger engines and heavier cars for a more efficient alternative. That is where carbon fiber comes into play. Carbon fiber was first developed as an aerospace material and was once far too expensive to mass produce for automobiles. As technology has developed new and easier ways to mass produce the stuff, we have seen thousands of new industries popping up that revolve around carbon fiber, just like RW Carbon. Carbon fiber can be adapted to so many applications, from automobile construction to the manufacturing of furniture or even athletic gear, which makes it the prime material to head up our future industries. As technology develops new and easier ways to mass produce the stuff, we have seen thousands of new industries popping up that revolve around carbon fiber, just like RW Carbon. Does More Carbon Fiber Benefit Everyone? Because carbon fiber is such an adaptable material it can be used to satisfy every automobile owner’s needs. The “green” car owner looking for the most fuel efficient or electric car can even benefit from this new direction. Due to its’ strength, rigidity and lightweight characteristics, carbon fiber has the ability to decrease the weight in every car by hundreds of pounds. To those “green” drivers this sounds like a more efficient vehicle that now needs less fuel or power to accelerate. However, to the speed freaks this means faster 0-60 times, quicker braking and improved handling. With this said, carbon fiber is now the top contending material for every automobile manufacturer, and on top of every speed freak’s wish list. But, what about my Naturally Aspirated Big Displacement Engine? Do not worry as of now. The magnificent V8 engine and other equivalent large displacement engines aren’t disappearing yet, but rather transforming. As the world becomes more and more concerned with the health of our planet we are seeing big fuel guzzling V-8 engines being replaced with lower displacement forced induction vehicles. To all our American Muscle heads that are die hard fans of the naturally aspirated motors of the 90’s and the early 21st century this might be a concern. Coming from someone who drives a V8 himself I am slowing beginning to embrace this change. Those times of 10 mpg might be disappearing but a new age of faster, more agile and more efficient vehicles are on our horizon. Vehicles likes the all new BMW i8, Mclaren P1 and Porsche 918 Spyder are living proof of the new use of carbon fiber and hybrid systems in today’s vehicles. New automobile technology typically starts with the next hyper or super cars and trickles down as technology advances. 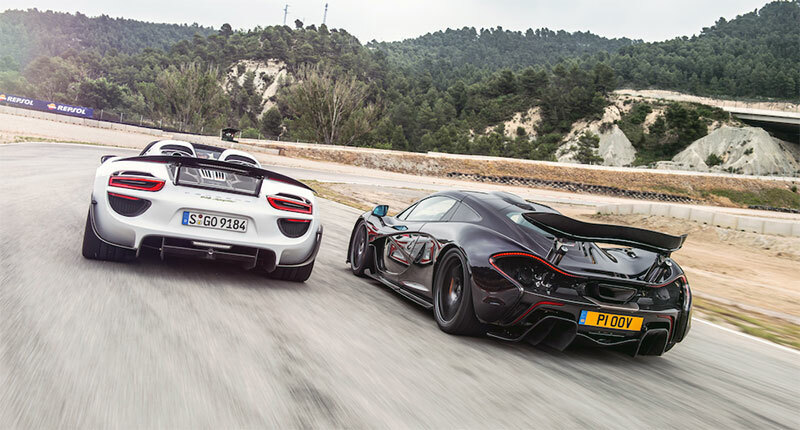 Both of these new super cars feature an unprecedented amount of carbon fiber use and a new hybrid power system that features electric motors and a gas powered engine to boost power numbers while making them incredibly fuel efficient. Carbon Fiber is definitely here to stay and will hopefully continue to advance and take the automobile industry to new heights. If you have any further questions about the future of carbon fiber in the automobile industry please email RW Carbon at info@rwcarbon.com. A walk through one of BMW’s many factories leaves no doubt in my mind that their true goal is really to make the “Ultimate Driving Machine.” In their quest to fulfill their mission, BMW is constantly testing new ways to better themselves and their vehicles. Nothing shows this better than their brand new BMW i8. This vehicle looks like something straight out of a concept car drawing and is now being sold worldwide. BMW has given the lucky ones that can afford it the opportunity to drive a piece of the future. From its’ revolutionary carbon fiber safety cell, to its’ advanced electric/petrol hybrid system, this car is the beginning of a new step for automobiles. Now that you know a little about the i8 and why it’s such a landmark in the BMW’s history, we can get into the good stuff, the carbon fiber. Unlike almost every car on the road today, the BMW i8 chassis is primarily made of carbon fiber or rather a carbon hybrid called carbon fiber reinforced plastic (CFRP). CFRP is a very strong and lightweight composite material that utilizes both carbon fiber and plastic characteristics to create something far more rigid. 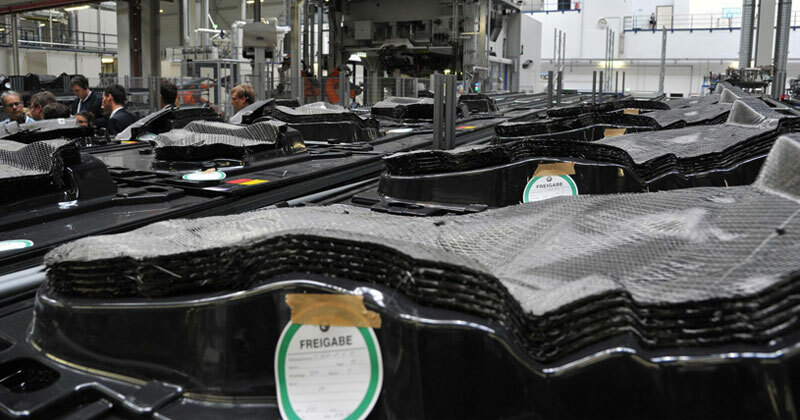 Carbon Fiber Reinforced Plastic being produced in Germany by BMW. RW Carbon offers many items made from FRP – A compound that is similar to the CFRP being used by BMW. 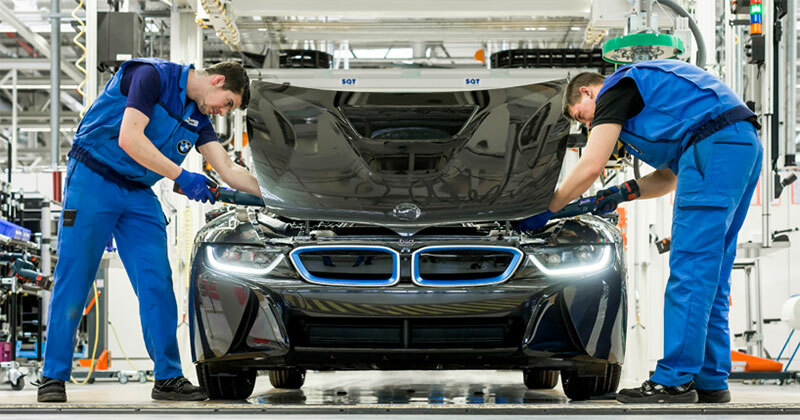 Due to the advancement of carbon fiber manufacturing, BMW’s is able to create the entire cell in 20 hours, a fraction of how long it used to take. Allowing the price of this new “concept car” to be far lower than it could have been years before ($130,000 to $140,000). In order to construct each body piece, carbon fiber laminates are laid on top of one another, arranged in a specific way as the fibers are all pointing in different directions before cutting them into shape. This ensures each panel will stay rigid with any directional force. Once cut into shape, each one is placed into a ‘preform’ mold which gives the panels their 3 dimensional shape. 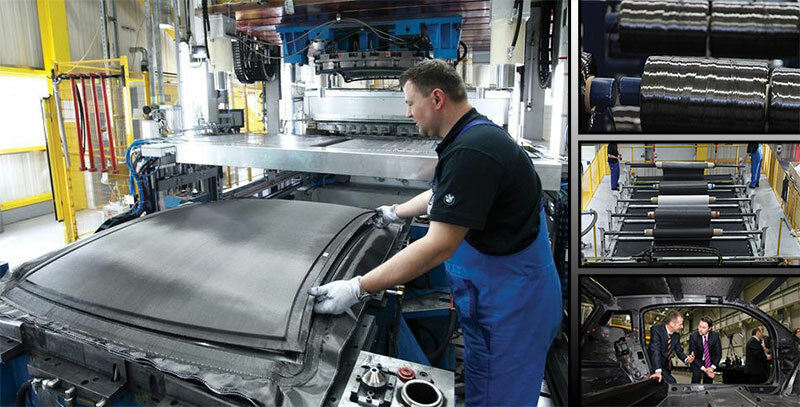 At the end of the process they are all joined together to create the first mass produced carbon fiber safety cell. If you have any further questions about the all new BMW i8 please email RW Carbon at info@rwcarbon.com. 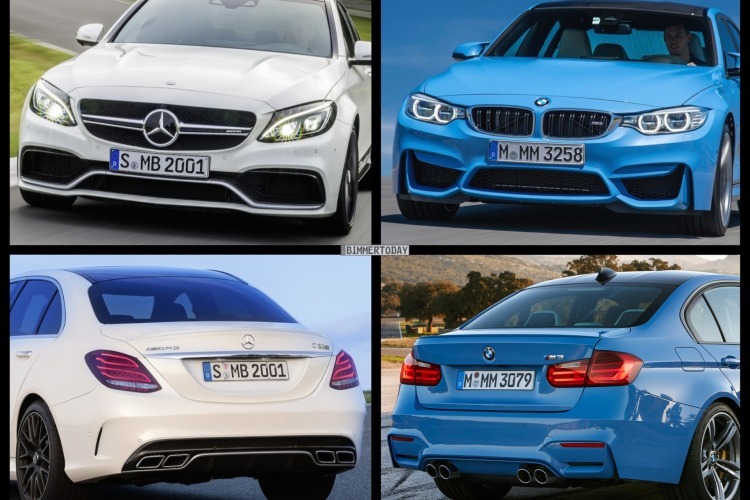 BMW F80 M3 vs. Mercedes W205 C63 AMG – Who Will Win? This week Mercedes fired back in the four door performance section with their brand new 2015 Mercedes C63 and C63 S. As our fans already know the new BMW has already been underrated by the BMW factory and is cranking out some serious power from the twin-turbo S55 engine. The new Mercedes C63 AMG will be powered by a 4.0L twin-turbo V8 outputting either 470hp or the range topping 503hp. Enthusiasts will be happy to know that this V8 engine will be the same one that is powering the Mercedes GT – Just detuned slightly. As always there will be no manual option, and the power will be put to the ground via the 7-speed AMG Speedshift transmission. In the speed department the new C63 AMG and the M3 are pretty evenly matched. 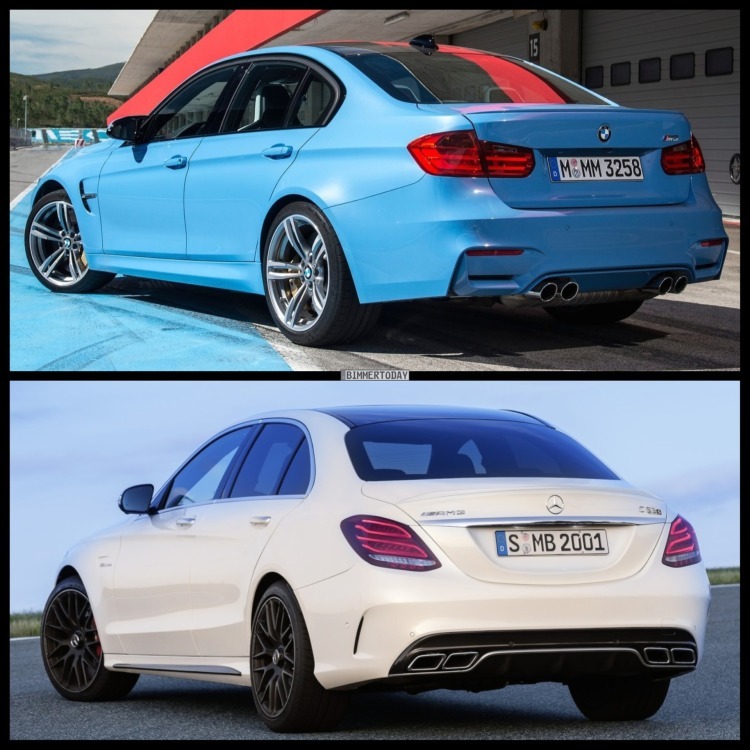 The C63 and M3 both boast a 0-62mph time of 4.1 seconds. It sure will be interesting to see the tuning potential however of both vehicles. The M3 has only been out for a couple months and tuners have already unlocked 100hp from the engine with just a new tune. We have even higher hopes for the new C63 since it will be powered by a twin turbo V8. We can see the C63 S running the 1/4 in 10 seconds with just the addition of a tune and slicks out back. When most of our followers think of carbon fiber they think of an exotic material used only on the highest performance vehicles. That is one reason why adding carbon fiber parts and/or accessories is such a hot topic right now, as every automotive enthusiast strives to make their car look unique. Luckily carbon fiber does not require as much care as the exotic cars they come on. 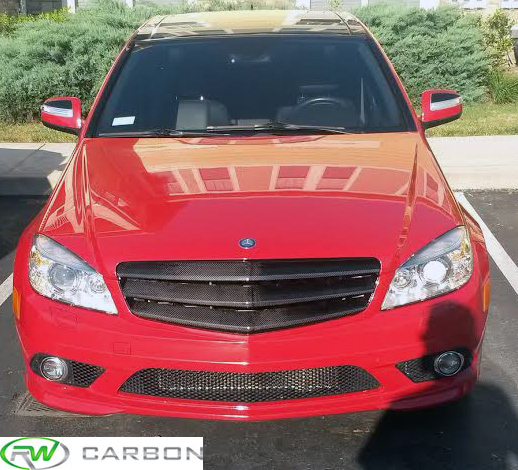 All of RW Carbon’s carbon fiber parts and accessories are finished off with a clear coat which gives them a protective layer and a nice shine. Because the clear coat is similar to the clear coat on your paint, our products should be treated with the same type of care. They can be washed with soap and water and for extra protection, finish each wash with a light polish and carnauba wax. The clear coat on our items tend to be softer than the clear coat on your paint so a nice soft polishing will get rid of any fine scratches. The carnauba wax will then protect the clear coat while enhancing the clear coat’s shine. Since carbon fiber trunk spoilers are very popular right now I will use them as an example on how to care for carbon fiber. For regular maintenance wash and dry it with the rest of your vehicle. 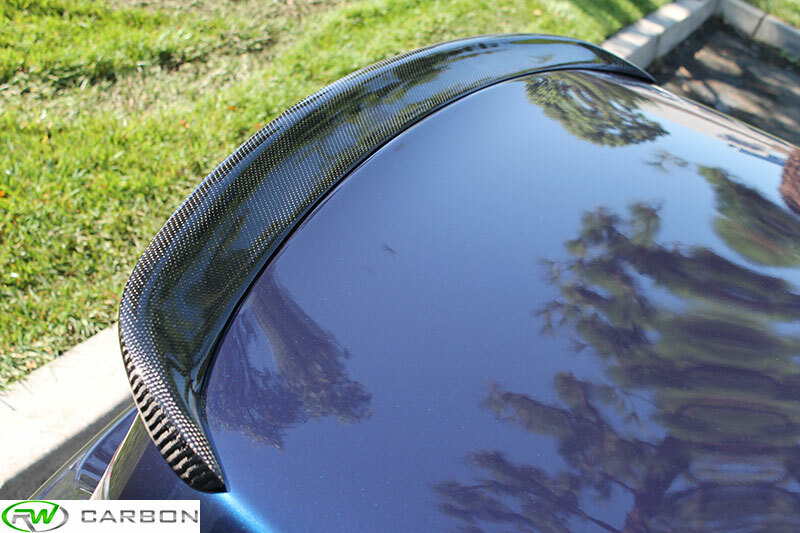 RW Carbon recommends that you lightly polish and wax the trunk spoiler or any other carbon fiber aero part after every wash to ensure it stays scratch free and glossy. If you live in areas with harsh weather then you will want to use a clay bar several times a year to remove embedded contaminants. To ensure the best care for your carbon fiber trunk spoiler RW Carbon also recommends that you polish and wax each part by hand. A machine in untrained hands can put bad swirl marks into the clear coat. At RW Carbon we like to use a microfiber wax applicator pad and towel. For the wax itself we like to use Meguriars Deep Crystal Polish and Carnauba wax, but any good name brand waxes will work just fine. 1. Wash and dry the trunk spoiler. 2. 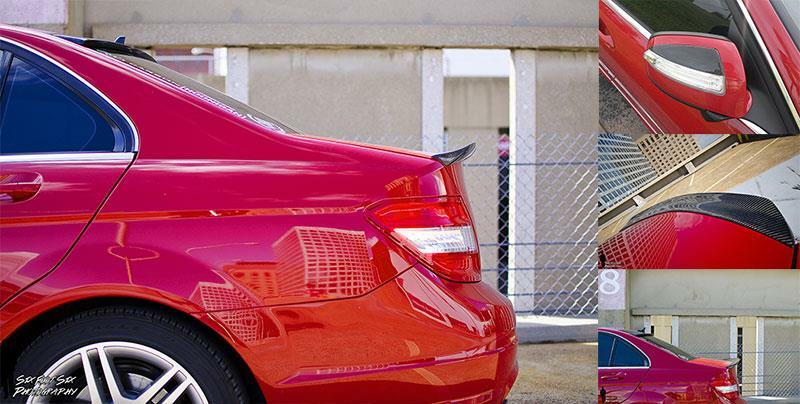 Park your car in the shade and apply a thin coat of polish by hand. Be sure to use light pressure as the clear coat is soft and can leave swirl marks behind. 3. Allow 5-10 minutes to dry (depending on outside temperature). 4. Wipe the dried polish off with a mircofiber towel. 5. Repeat steps 1-4 with the Carnauba wax. 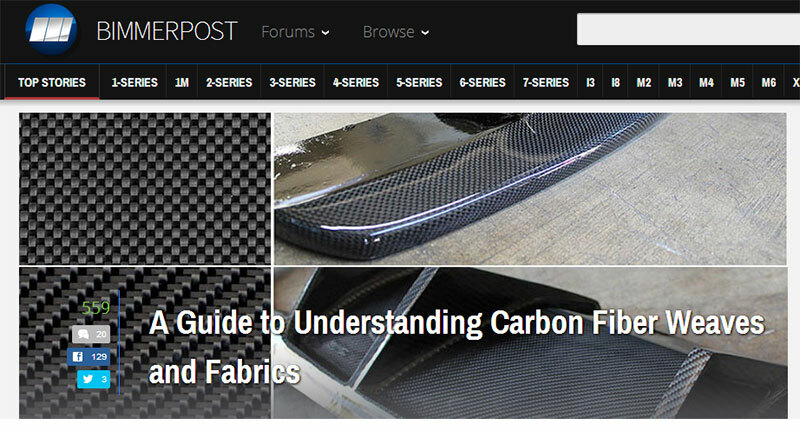 This morning one of RW Carbon’s articles (A Guide to Understanding Carbon Fiber Weaves and Fabrics) was published on one of the largest and most respectable BMW forum in the world. We would like to thank Bimmerpost for this great honor as we can further share our expertise and knowledge with the community. One Goal, One focus – Carbon Fiber. 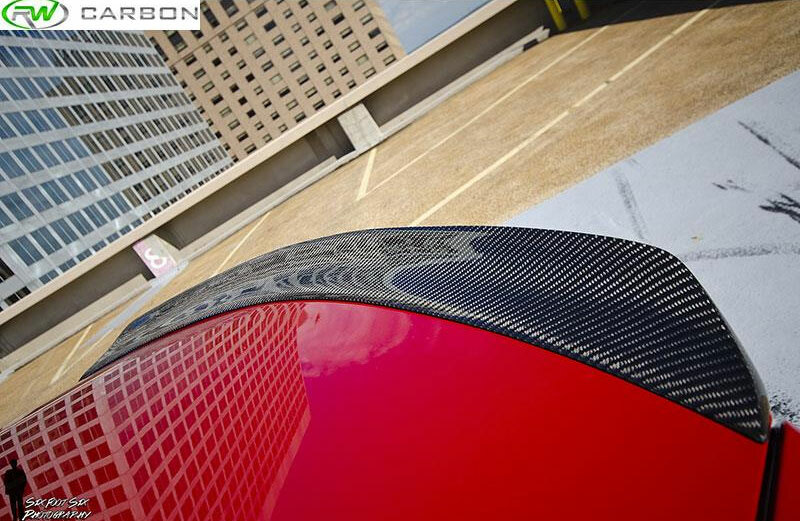 If any of our readers would like to know more about carbon fiber please email us at info@rwcarbon.com.